Last month I attended the Gaithersburg Book Festival and Caroline Leavitt was one of the guest authors. After hearing her speak, I knew that I had to read her newest book Pictures of You. Just like the characters in her book, Caroline spent time in the Cape Cod area. As a child she suffered from life threatening asthma as did Sam, the 10-year-old boy in Pictures of You. According to Caroline, as she wrote about Sam and his asthma, her own symptoms began to disappear. Carolyn also had a fear of driving and so it seems fitting that the book should revolve around a terrible accident and that Isabelle, who survived the accident in Pictures of You should develop a fear of driving. I can still hear Caroline Leavitt’s voice as she read from the first chapter of her book, her voice getting louder, faster and stronger with a sense of urgency as the audience sat frozen in their seats. “Get out of the road” Isabelle screams. Frantic, she grips the wheel. “What are you doing!” she shrieks, but the woman seems pinned in place. In the distance she can hear a voice, like a splash of pennies, and then she sees a child- a child!- a boy with dark flying hair and when he sees her, for a moment, he freezes , too. His eyes lock onto hers and for one terrifying moment, Isabelle feels hypnotized, for one second Isabelle can’t move, either. And then, she smashes on the horn and he startles and bolts across the road, disappearing into the woods, and her car is going too fast and she can’t stop. She can’t control it. Her heart tumbles against her ribs. Her breath goes ragged. She’s losing control, and despite herself, she’s praying: God. Jesus. Then she hears the hornet again, which flies past her out into the night and then the woman finally moves, pressing herself closer to the sedan, and it’s too late, and the two cars slam together like a kiss. What were Isabelle and April doing hours from home,on a deserted road that foggy day with a single suitcase in each of their cars? What were they running from and why? 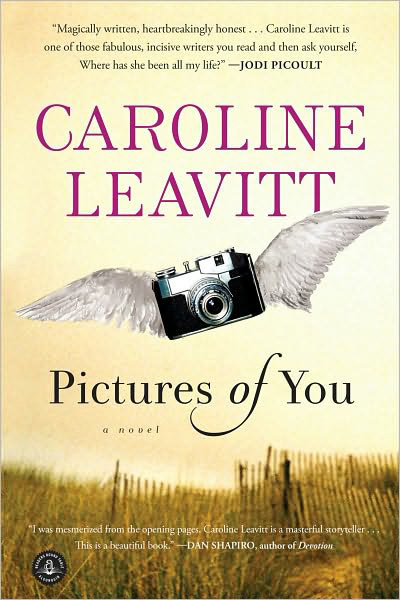 Not only is Pictures of You a real page turner, but it is also a thought-provoking book. How well do we really know the ones we love? How much are you willing to forgive? How do you let go of the past and move on? Once I started reading Pictures of You, I could not put it down. I look forward to reading more novels by this talented author! I adore you for posting this. It means so much to hear how readers experience my work–and this was so beautifully written–and so very generous of you. Hi Caroline, Thank you for visiting our blog! I thoroughly enjoyed your book Pictures of You and think it would make a wonderful movie! I read this book too and thoroughly enjoyed it. It’s a good discussion book as it touches on several universal themes that affect us all. Plus, it has the added bonus of not being totally predictable. Your review really makes me want to read this book! Looks great!